Chaz Davies says he could barely have hoped for a better debut season in the World Superbike Championship after celebrating his first victory. 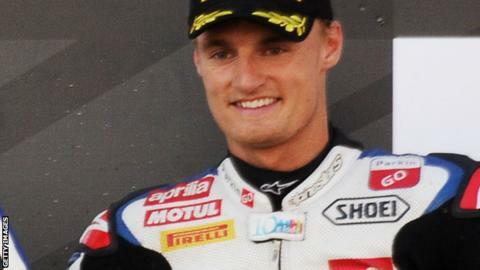 The Welshman, 25, won in Germany on Sunday, the same day as his move to BMW Motorrad for next season was confirmed. Having already secured two podium finishes, Davies added another third-place in the first race in Nurburgring before winning the second race. "It was a great day all round," said Davies, currently of ParkinGo Aprilia. "My bike was working really well, I think we did a great job with the set-up over the weekend. "I was able to hang on and the margin of victory at the end was three seconds so it was fairly comfortable. It was a really good feeling." Presteigne-based Davies, who graduated to Superbikes having won the World Supersport title last year, was told to take his time to familiarise himself with the step-up. His first podium finish came with a third place in round eight in Spain, and his confidence on the more powerful bike has grown ever since. "This is a different ball-game altogether," he said of the step-up to Superbikes. "The bikes are a lot faster, a lot more technically advanced so they are a million different set-up combinations. "But the big difference is the power - these bikes are capable of over 200 miles an hour. I think I've done 209mph this year so they take a bit of hanging onto. "I'm up against the best Superbikes riders in the world, they are guys who have won multiple world championships over the last 10 years. Every race weekend is a battle, but we are getting there. "Winning is always in the plan. This year has gone from strength to strength for me. I broke my wrist in the first race, but nine race weekends later I'm winning races. "That's the direction we want it to go, it's all about improving." And with a move to a BMW-backed team awaiting next season, Davies is excited by the prospect of many more victories. "That's a different step for me - a step forward in my career I haven't had before because I'll be racing for a factory team with all the might of BMW behind me," he said, currently in eighth place in the Superbikes standings with two rounds remaining. "That's obviously a hell of an opportunity in itself so I'm pretty excited, things are going really well at the moment."